Subscribe for free in iTunes. Today’s topics: On today’s show, Scot and Fr. Matt welcome Andreas Widmer, who will talk about his experiences as a Swiss Guard during the reign of Pope John Paul II, his reflections as a Catholic businessman, and the witness he will give at this weekend’s 4th annual Eucharistic Congress for Young Adults in Boston’s North End. 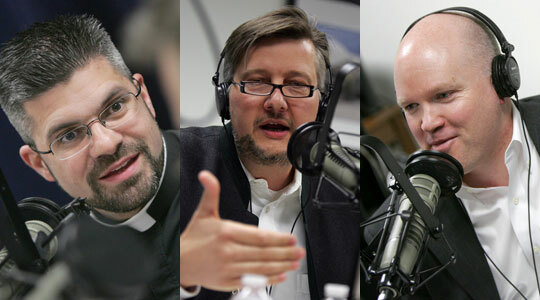 A summary of today’s show: Andreas Widmer told Scot and Fr. Matt of his first encounters with Pope John Paul II as a Swiss Guard and how the Pope’s holiness and attention to each person he met changed Andreas’ life. Scot and Fr. Matt also shared stories of their encounters with the soon-to-be beatified pope. Also, the Eucharistic Congress this weekend is dedicated to John Paul II. 1st segment: Fr. Matt discussed the awards banquet coming up next Tuesday for the Office for the New Evangelization of Youth and Young Adults that honors both youth and the adults who serve them. There is a selection process in which people are nominated for awarding. There is a high quality of people involved in youth ministry in the archdiocese. He said there will be 120 awards. Cardinal Sean will be there. Our photographer, George Martell, will be receiving an award for the many times he’s recorded youth ministry events for our archdiocesan sites, including our Flickr page. Fr. Matt said he’s used many of George’s photos advertising youth ministry events. 2nd segment: Scot andFr. Matt welcome Andreas Widmer. He is the CEO of Seven Fund. It promotes enterprise solutions to opvoerty. Using entrpeneurship and business to help people escape poverty instead of government aid. They work mainly in Africa and Asia. The intersecition of his faith and the work of Seven Fund is encapsulated by John Paul II’s statement that with work we don’t just make more, we become more. True dignity comes through the pursuit of excellence in whatever we do. All the great saints have said work should be prayer. He will be one of four speakers at the Eucharistic Congress this weekend. Fr. Matt said they more than 200 registrants, which makes them ahead of last year. They encourage pre-registration, but they will still accept people at the door. It will be rain, snow, or shine. On Friday, at Sacred Heart Church in the North End, they will open with prayer and music by Jon Niven, music minister at Life Teen at St. Mary, Dedham. The theme is “John Paul II: Be Not Afraid, His Life, His Witness, His Challenge.” Fr. Roger Landry will speak on Pope John Paul II and the new evangelization. Fr. Matt is a fan of his website CatholicPreaching.com. He did his graduate work in Rome on Pope John Paul’s writings. Then Fr. Dan Hennessey will speak about the vocation monstrance, one of several monstrances blessed by Pope John Paul II to be sent around the world for prayer for vocations. April 2 will be the sixth anniversary of Pope John Paul II’s death. There will be confessions during Eucharistic Adoration. Then there will be a procession to the downstairs chapel and then adoration all night. On Saturday morning, at 10:15, Andreas will speak on “Be Not Afraid: ” and then they will go into service projects all over the city of Boston. Anything from writing letts to confirmation students to visiting with the elderly priests at Regina Cleri to cleaning up a park. After that will be Mass with Cardinal Sean and then dinner provided by the restaurants of the North End. Fr. Matt expects Cardinal Sean’s homily will combine Pope John Paul’s preaching with the topics of the 4th Sunday of Lent. Scot said he knows Cardinal Sean enjoys meeting with young people especially, as can be seen by his creation of the Office for the New Evangelization of Youth and Young Adults. When he meets with the young people he appears transformed. Saturday evening, Sr. May Ann Toomey of the Sisters of Life will speak on the culture of life as defined by Pope John Paul II. The Sisters of Life were found by Cardinal John O’Connor of New York to be a witness to life and to work for life. At the end of the Eucharistic Congress on Saturday is the very moving Eucharistic procession through the North End after a time of prayer music before the Blessed Sacrament. All the seminarians are there in cassock, priests and deacons and religious in their religious garb. They have bells and candles and a canopy and they’re followed by 400 people. They stop at several makeshift altars through the North End and pray. It is moving to see 500 people all kneeling in prayer. People look out from apartments and restaurants to see. Fr,. Matt remembers a woman coming out of a restaurant to see and crying because she is so moved. They have street evangelizers to speak with them, not to convert, but to just invite them to be a part. 3rd segment: Andreas grew up in Lucerne, Switzerland in a very small German-speaking village. Scot asked him how he came to join the Swiss Guard. Andreas said that from a young age he was very interested in the outdoors, scouting, the military. He heard about the Swiss Guard and decided he would join. He wasn’t very religious, but thought it would be cool to become a bodyguard. Looking back, joinging was a symptom of his restlessness, feeling like he wanted an identity, feeling inadequate. He came to Rome as a 20-year-old in 1986. He went through recruit school and one of his first assignments, on Christmas Eve at the apostolic palace. From his background, Christmas Eve was the biggest day of the year and he was devastated that he would have to work. Before his assignment, he stood in line for the one phone for all 115 guardsmen to talk to his family. His father asked him how he was celebrating and he said he had to work. His mom came on the phone and started to cry, which made him cry as well. He said he loved her and hung up. He went to his assignment which was to stand in a small anteroom between the outer door and inner door to the papal apartments. He was all alone and cried for himself for about an hour. Finally he heard from his commander that Pope John Paul II would be coming out his exit to celebrate midnight Mass. He quickly composed himself and opened the door. Pope John Paul was standing there, looked at him and said, “You’re new. What’s your name?” He held out his hand and as their hands clasped, John Paul looked into his eyes. He knew from his red eyes that he had been upset and noted that he was away from home for the first time. That set Andreas crying again. He pulled Andreas close, thanked him for what he was doing for John Paul that night, and told him that the Pope would pray for him that night. On one of the biggest nights of the year, with one billion Catholics looking to the Pope, he became the focus of his ministry. Pope John Paul was his ultimate boss and right there in his work environment, Andreas was ministered to by his boss. In an indirect sense, John Paul helped Andreas ultimately to find his vocation. During his talk on Saturday, Andreas will get into what that means. Scot mentioned that so many people in this generation can point to John Paul II’s example and witness as an inspiration for their own vocations and lives. Andreas says he has met many people over the years who met JPII, even if they were a person in the back of the crowd, that he made them feel as if they were the reason he got out of bed in the morning. This is an example for us, to make the people in our lives feel as if they are the reason we get up in the morning, especially those who are closest to us. Scot recalls going to a Mass with the Pope in 1998 on the Pope’s birthday in his private chapel. He remembers asking the Holy Father to pray his aunt who was in the hospital. The Pope said, “Let’s pray for her now.” He pulled Scot and his brother close and prayed for her right then. Fr. Matt went with a few brother seminarians in 1999 to Rome. They were able to go to the private Mass with the Holy Father. Fr. Matt was asked to do the responsorial psalm. As they entered the chapel, he saw John Paul II on his knees in contemplative prayer preparing for Mass. Fr. Matt experienced the presence of the Holy Spirit and knew he was in the presence of a man whose holiness and love for Christ radiated from his being. The papacy itself awes us as Catholics, but when a bishop is a saint, their presence transcends the normal awe. Scot asked Andreas what he observed of the interactions of John Paul II that most people would not know. Andreas said he treated everyone the same. He would spend time with every single person who he met. Andreas started to realize that he was privileged to be part of that ministry, to experience that same ministry he experienced on Christmas Eve, to see the Pope touch the souls of so many people just like Andreas. Scot said that as a phenomenologist philosopher, John Paul believed that an encounter could change your life and this perhaps motivated his desire to travel everywhere in the world and meet everyone. He kept an intense schedule with long days. Andreas said the Pope’s schedule never let up, even towards the end. Many of the very fit and young Swiss Guards said they couldn’t keep up with the Pope. As an example of his treating everyone the same, John Paul instituted an audience just for the gypsies (the roma) who were treated with suspicion and disdain by everyone else. Andreas has spoken often on his experiences and has written a book called “The Pope and the CEO” to be published in September by Emmaus Road Publishing. Within a framework of his stories of Pope John Paul are nine lessons on how to order life in business as a Christian. Scot asked what it is like to speak about Pope John Paul II from a perspective that most others have not had. Andreas said it is a responsibility and privilege. Andreas said it was Scot who set him on this path in the first place. But when John Paul died, Andreas providentially in Rome the next day and was able to visit his body in the apostolic palace. He made a vow at that time to never tire of speaking of Pope John Paul II and of Jesus Christ and the message he has been given. Andreas is so excited to perhaps inspire even one person with the example of Pope John Paul II. 4th segment: Every Wednesday we are happy to announce the winner of the 1060 WQOM Benefactor raffle. This week the recipient will earn a copy of the The 2011 Calendar of Indulgences from Bridgegroom Press, which is entitled this year “The Beauty of Grace”. It has great photos of beautiful churches and a lot of helpful information from the Church’s liturgical calendar. This week’s winner of the Benefactor Card raffle is Carmel & John Philippakis from Quincy. Congratulations to Carmel and John! If you would like to be eligible to win in an upcoming week, please visit WQOM.org. For a one-time $30 donation, you’ll receive the Station of the Cross benefactor card and key tag, making you eligible for our weekly raffle of books, DVDs, CDs and religious items. We’ll be announcing the winner each Wednesday during “The Good Catholic Life” program. 5th segment: Tonight is the 3rd Wednesday of The Light Is On For You in the Archdiocese, where every parish and chapel is open for confessions from 6:30-8pm. We are taking listener questions. 1. Has Andreas ever been to confession with Pope John Paul II. No, but JP2 wanted to stress that every priest is a priest, on Good Fridays he used to go to the confessionals in St. Peter icognito and he hear confessions. Scot said many cardinals and curial officials do the same thing. 2. Scot said last week his son asked if he needs to memorize the act of contrition or if he could make it up on his own. Scot told him that if he doesn’t use the written prayer, but could say something heartfelt expressing his contrition. So what is necessary for an act of contrition? Fr. Matt said there are numerous formulas for expressing sorrow in the rite of confession. The words should express the sorrow in the heart, asking God for mercy and the grace to go forward and sin no more. 3. Has the increase of psychology and therapy led to the drop in the use of confession? Andreas said you see in popular culture—TV shows and movies— that therapists do occupy that role, as a confessor. whether we go to confession or not, we have an innate need to reconcile with God. So if we don’t go to the sacrament, we still seek some way of finding forgiveness. Without downplaying the importance of therapy, when it comes to coming clean with the Lord is confession. Our culture has an almost perverse delight in detailing the sins and scandals of those in the public eye. And ordinary people are eager to get in on the action! We produce an entire genre of “reality shows” which put on public display much sinful behaviour that people should be embarrassed about, not celebrated for. Seems as if everybody’s “going to confession” except in the sacrament! There are a parade of talk shows in which the troubled and afflicted share their intimate secrets with a vast television audience. People use social networks to make available to all on the internet what should be treated with utmost discretion. We have a “confessional culture.” It seems at every moment someone, somewhere is shouting for our attention, eager to confess from the rooftops what Catholics have the opportunity to whisper in the confessional. The “confessional culture” around us shouts itself hoarse for it can confess, but there is no absolution. Sin confessed but unredeemed either leads to despair or is trivialized. We see the despair in the vast anguish that fuels an enormous therapeutic industry. We see the trivialization in the celebrity scandals that become not occasions for averted eyes, but fodder for jokes. Our culture does not need to be taught how to confess; it needs to discover where forgiveness can be found. Our culture does not need to further expose the stain of its sinfulness; it needs to discover the only One who can wash it away. We Catholics have the blessing of teaching our “confessional culture” about true mercy, but we cannot give what we do not have! I challenge the Catholics of the Archdiocese to make a good confession this Lent and then to tell one other person – perhaps a friend or relative or colleague who has been away from the sacraments for a long time – about the liberating joy of God’s mercy! Fr. Matt said that we forget that sin does not make us happy. We go to therapists sometimes to convince ourselves that our sin does not make us unhappy.